With a hint of pumpkin flavor and packed with cheddar, Pumpkin Cheddar Biscuits are perfect for breakfast or topped with a savory red pepper dip for an afternoon nibble. This post is sponsored in conjunction with PumpkinWeek. I received product samples from sponsor companies to aid in the creation of the PumpkinWeek recipes. All opinions are mine alone. I cannot believe that #PumpkinWeek is almost over! Can you? There’s just two days of pumpkin goodness to be shared and then you have recipes to make until the next one comes around next year. Oh yeah! This event is an annual one. I’ve participated in it since 2016, I think? I just looked. It’s been since 2014!! WOW! I’ve listed all my #PumpkinWeek recipes at the bottom. You should check them out! I guess that makes sense since Facebook sent me a notice that Terri and I have been friends for 4 years. My how time flies. I still can’t believe I’ve been seriously blogging for almost 6 years now. Just blows my mind sometimes. I just keep plugging or typing away at it and slowly growing it up to be a big blog at some point. No, it’s not going to replace my day job. At least not until I get to be as big as Pinch of Yum or something like that. Anyway, that’s a bit of an off track rant there. Back to the post at hand! These Pumpkin Cheddar biscuits! Don’t ask me why biscuits. I guess it was past due time for me to make biscuits and #PumpkinWeek came up. Voilia? Pumpkin biscuits? Adding in the cheddar was a no brainer when Cabot Cheese signed on as a sponsor for this event. Yes. I’m going to brag about my long history and tradition with Cabot cheese. Might not be as long as some, but I’ve known about their quality and flavor since my sister moved there in 1990 something. I can’t remember, but it was sometime between 1993 and 1995. Maybe she’ll chime in with an actual year in a comment. My sister moved to Vermont and introduced us to the most amazing cheese we’ve ever tasted. No. I’m not kidding. It is the most delicious cheese I’ve ever tasted. She lived near a “factory” store for lack of a better word. We would make a stop there before driving home and pick up quite a few 5 pound blocks of cheese that we would eat and/or freeze to eat later. That’s when I became totally addicted to their Vermont sharp Cheddar. That sharp flavor is not as bitter as a New York sharp Cheddar. Not that I would snub a New York sharp Cheddar. Heck I’m a cheese fiend and don’t usually turn my nose up to any of it. Though I do cut the rind off most brie cheese. I cannot stand the taste of that stuff. Even if I’m going to bake it. But Cabot doesn’t have brie. Back to the sharp Cheddar. It has that sharp flavor but it’s a smooth sharp that’s super creamy. Vermont sharp Cheddar doesn’t crumble like a New York version does. It slices and you can easily melt it into and onto everything. Is anyone else drooling? To say I was absolutely thrilled that stores in these parts started selling their cheese is an understatement. Now, there is always at least one or two 8 ounce packages in my fridge at any given time. It’s makes the best macaroni and cheese, grilled cheese, cheese and crackers, toppings for tacos, chilis; you name it! That’s why it’s always good to have several packages in your fridge. You don’t want to run out. That would be a cheese sacrilege. This batch makes about 12 to 14 biscuits depending on how big you cut them. I used a wide mouth jar ring to cut my biscuits and re-rolled the dough a couple of times and easily for 13. I could have used that last little bit to make one more, but since it’s just the two of us I didn’t think 14 biscuits was warranted. But after baking them and then tasting them. It was totally warranted. These babies are fabutastic. And I mean that because the hubs and I ate one before the photo shoot and one after the photo shoot. They had rich pumpkin flavor and delicious cheddar sharpness to them. Oddly enough, the day after baking them the pumpkin flavor is more subtle and the cheddar flavor is more prevalent. I had no idea that would happen! Not to worry though because they still taste amazing. And they totally vanished at work. Apparently, the office was talking about them. So much so that someone working in our office was giving me a hard time about not offering one! He’s new. He doesn’t know the rule. If it’s on my desk, it’s free to everyone! You could easily top them with butter. I contemplated a cheddar butter but thought that might be a bit of an overload. However, I still might try that for something else though. I mean, doesn’t a compound cheddar butter sound divine? The topping here is a pepper relish I had in the fridge. It’s sort of like pepper jelly meets bruschetta topping. At least that’s what it reminded me of. Anyway, the combination of the sweet and savory topping went well with the biscuits. They’re not sweet, though; the biscuits. They’re all savory. I didn’t put sugar in them at all. Just saying. I took them to work the next day and topping one with cream cheese. That was delicious, too. You could get flavored cream cheese like scallion or veggie. That would be scrumptious. Of course, you could easily top them with an egg, sausage, and some cheese for a delicious breakfast sandwich. Yeah, I totally want to split that one in two and devour it as well. I know you’re thinking it. So, what’s stopping you from making a batch right now? Oh! You’re at work. Okay well, the weekend is coming up. Spend some quality time in the kitchen with these biscuits and Cabot cheeses, butters, and yogurts. They have quality products you and your family will love. Make sure you follow them on social media! They have some drool worth recipes and ideas to share there. And don’t forget to enter the giveaway! Combine the flour with the baking soda, baking powder and salt. Stir in the cheese making sure it’s separated and coated in flour. Using a pastry blender or two knives, but the butter into the flour mixture until it resembles coarse meal with a few small pea sized bits. Turn the dough out into a flour work surface and knead lightly. Roll to 1/2 inch thick, fold into thirds, and then roll out to 1/2 inch thick again. Using a biscuit cutter (or a jar ring) cut the biscuits and place on baking sheet lined with a silpat or buttered parchment paper. Bake at 425 for 8 to 10 minutes or until golden brown around the edges. Cool slightly before slathering with butter or topping with pepper relish. 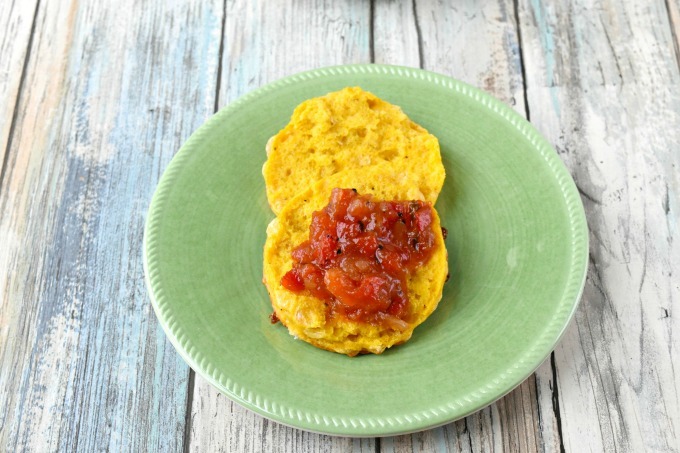 These pumpkiny cheddar-packed biscuits have my stomach growling at 7:30 in the morning. I can’t even imagine how great these taste! Wonderful recipe here, especially for fall! Thank you! They did vanish at work. These biscuits sound delicious. I love the color the pumpkin adds too. Thank you! They came out so pretty from the pumpkin color. These biscuits looks so good, I’m drooling over here. Perfect for fall. Thank you! A little pumpkin butter on top and you’re all set. Perfect biscuits…….I think they would make a great side for a warm, comforting bowl of soup or chili.